Auch auf Audio-Plattformen wie der Soundcloud ist Rembrandt längst angekommen. Die National Gallery of Art in Washington D.C. bietet Audioguides zu ausgewählten Werken in verschiedenen Sprachen wie Englisch, Russisch, Mandarin an. Auf der Plattform Soundcloud kann das Museum derzeit bei knapp 1.000 hochgeladenen Tracks ca. 700.000 Follower verbuchen. Rembrandt van Rijn – Self-Portrait – Painting – Andrew W. Mellon Collection – 1937.1.72″After learning the fundamentals of drawing and painting in his native Leiden, Rembrandt van Rijn went to Amsterdam in 1624 to study for six months with Pieter Lastman (1583–1633), a famous history painter. Upon completion of his training Rembrandt returned to Leiden. Around 1632 he moved to Amsterdam, quickly establishing himself as the town’s leading artist. He received many commissions for portraits and attracted a number of students who came to learn his method of painting. Rembrandt painted, drew, and etched so many self-portraits in his lifetime that changes in his appearance invite us to gauge his moods by comparing one image to another. Such a biographical reading is encouraged by the way in which the artist confronts the viewer directly. Rembrandt painted this self-portrait in 1659, after he had suffered financial failure despite so many years of success. His spacious house on the Sint-Anthonisbreestraat and other possessions had been auctioned the previous year to satisfy his creditors. In this late work, the deep-set eyes that bore into those of the viewer seem to express inner strength and dignity. 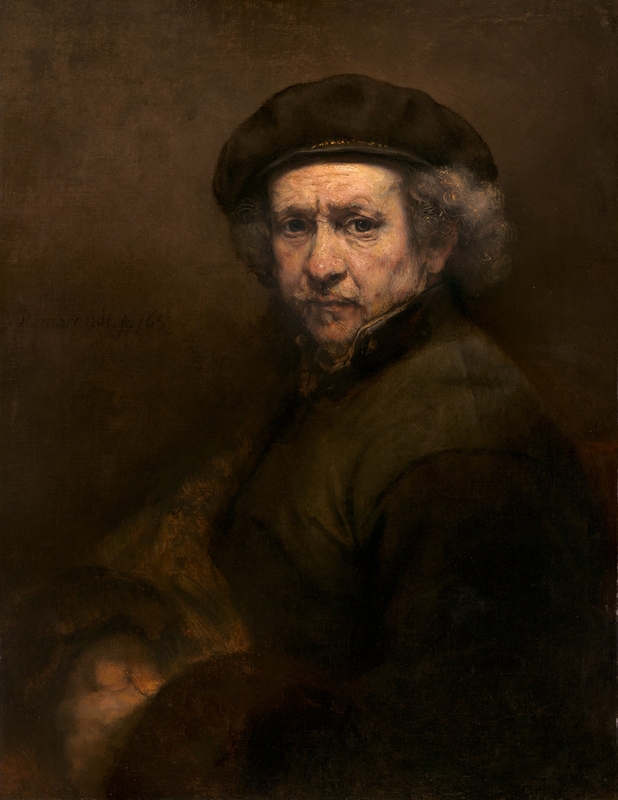 Interpreting paintings on the basis of an artist’s biography is nevertheless dangerous, particularly with an artist whose life has been romanticized to the extent that Rembrandt’s has.